All about that base: 5 Top Tips for getting your #foundation just right! Longer days usually means more sunshine and more outdoor-photo shoots, so I always make sure I have products with a good sun protection factor. SPF 15 to 30 is good for a foundation. I also sometimes make sure the moisturiser I apply underneath has at least SPF 15. I like to keep it light but with good coverage. A base that lets the skins natural beauty shine through but stays put throughout shooting is really important, especially in the summer when the heat makes us feel like we’re melting! If you regularly catch my blog, you’ll know I’m a big fan of an Airbase airbrushing foundation. If I’m creating a no-makeup make-up look, then I some times also like loose mineral powder with light reflecting particles to give a soft-focus finish which works well with light, powder blusher or bronzer for some sun-kissed definition. This is perfect for an outdoor summer shoot or wedding, when there is lots of natural daylight. Just be sure to blend any cream concealer carefully for a flawless, natural look. Primers can be great but watch out for any that lighten the makeup and alter the colour tone to make it look ghostly under camera lighting or flashes – a no-go at a shoot and on your wedding day. I usually do a quick colour check along the jawline and sometimes on the inside of the wrist, where the skin tone is paler, just to check that the colour tones match and blend well. It’s a tried and tested trick – but one of the best! This is a fantastic product, and you can see the positive result on Michelle’s face and neck… there is a significant reduction in redness, and even finish and a brilliant flawless base for make-up application. 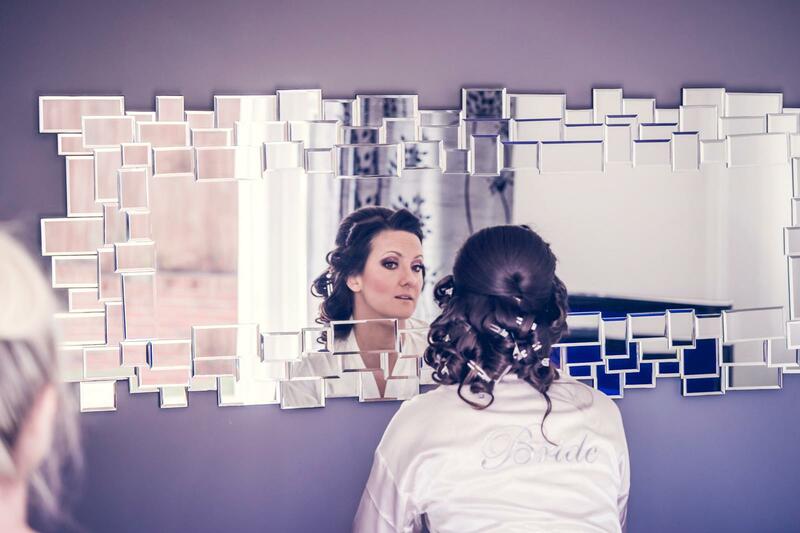 Why do #brides love #airbrush #makeup? Back in 2010, I completed an Airbase Airbrushing Foundation course, and if you have seen my Services page or what my salon Pinkies offers, you’ll see that I specialise in the application of this foundation technique. This is a perfect foundation to build a makeup look on for bridal due to its silicone base. This silicone gives a flawless, long lasting, smooth and natural look that doesn’t need any touch-ups throughout the day. So as I already wrote – perfect for a bride! Brides want to look flawless right? And you can perspire with nerves or excitement, or get a sweat on under the lights or heat of the sun, especially in a dress and veil… so you need a base to your makeup, whether you are going natural or glam, that will maintain a fresh finish… and this really does! In use, an airbrush atomises the product (in this case Airbase Foundation) making the particles of makeup tiny. This is the reason why airbrush makeup is used in HD TV and film… And this is a revolution as HD TV picks up absolutely every imperfection – but Airbase will hide every imperfection including blemishes, birthmarks and tattoos…. So brides can truly feel like superstars on their wedding day with the knowledge that they will look flawless in their photos and on home video even in high definition! The image shows before and after using Airbase Airbrushing Foundation.